LAKEWOOD, Colo. --- The South Dakota School of Mines men's basketball team earned a big win Friday night defeating the Colorado Christian University Cougars, 77-63, during a Rocky Mountain Athletic Conference matchup on the road in Lakewood, Colo. 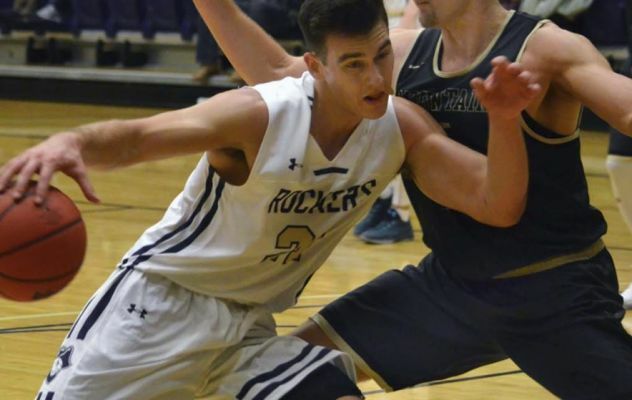 The Hardrockers fought their way to a 42-33 halftime lead and held off a Cougar rally midway through the second period to pick up their second conference win in a row. SD Mines led by as much as 14 points in the second half, before CCU whittled the lead down to four points. The visitors were able to regroup and push their edge back to double digits before the final buzzer. The Hardrockers finished the game shooting 52.6 percent from the field hitting 30-57 attempts. They were 4-12 from the three-point line and a perfect 13-13 on free throws. SD Mines collected 34 rebounds, 10 assists, six steals and one block. The Cougars made good on 23-54 attempts to shoot 42.6 percent and was 9-19 from beyond the arc and was 9-11 from the foul line. CCU came down with 25 rebounds, 14 assists, four steals and one block. CCU had no answer for SD Mines sophomore Logan Elers who had a career night for his team. He cashed in for 25 points and came down 11 rebounds for a strong double-double. He also came away with two steals and an assists. Freshman Wilfred Dickson contributed with 14 points, senior Brian Orr added nine markers and junior Jacob Anaastasi added eight. The win gives SD Mines a 4-3 overall record and 2-1 in the RMAC. Next up, the Hardrockers have a big challenge taking on the No. 6 national ranked Colorado School of Mines Saturday in Golden, Colo., at 7 p.m. Meanwhile, The South Dakota School of Mines women's basketball team capitalized on a second-quarter momentum surge, outscoring Colorado Christian University, 15-5, and went on to defeat the Cougars, 51-43, Friday night during a Rocky Mountain Athletic Conference game in Lakewood, Colo. It was tough sledding for either team in the first quarter with SD Mines taking a slight 11-10 edge after the first quarter and then exploded in the second frame to go into the half with an 11 points advantage, 26-15. That proved to be the difference in the game, as Colorado Christian bettered the visitors, 28-25, in the second half but could never get over the hump. The Hardrockers shot just 35 percent on the night, hitting 16-46 attempts, including 5-15 from the three-point line and 14-20 from the free throw line. SD Mines collected 36 rebounds, eight assists, three blocked shots and one steal. The Cougars made good on 17-57 baskets to shoot 30 percent from the field. They were 4-17 from three-point range and 5-8 from the foul line. CCU recorded 12 assists, seven steals and three blocks. Individually for the 'Rockers, sophomore Anna Haugen had another double-double on the season, earning 14 points and coming down with 10 rebounds. She added two assists, one steal and one block. Freshman Ryan Weiss also had a good outing, contributing with 11 points, six rebounds, one assist and one steal. Sophomore Sami Steffeck added nine points and sophomore Molly McCabetacked on eight markers. CCU leading scorer was Sarah McGinley with 22 points while Jordan Baer added eight. The win improves SD Mines to 6-2 on the season and 2-1 in the RMAC. Next up, the 'Rockers will be in Golden, Colo., on Saturday to challenge the Colorado School of Mines.